Review of recent results from a real dividend growth stock portfolio. Discussion of portfolio changes in the third quarter of 2018. Example of how a dividend growth investor manages his portfolio. Build a sustainable and rising dividend income stream that beats inflation. Preserve and grow my capital by attaining a satisfactory total return on my investments. In this article, I will provide an update on my progress toward achieving these goals since my previous review. As always, I will be presenting real results from a real portfolio involving real money. I contributed $3,500 in new capital during Q3, increasing my year-to-date total to $22,000. I am on track to reach and likely exceed my year-end goal of $25,000. Dividend growth stocks represent the parts of my dividend growth machine. The table below shows the composition of my portfolio at the start and the end of Q3 2018, with changes highlighted. I started a position in BlackRock (BLK), a financial company that provides investment management and advisory services for retail and institutional clients. It has over $6 trillion in assets under management and clients in more than 100 countries. Many investors are likely familiar with the company’s popular iShares exchange-traded funds. It is a well-run company with a wide economic moat that will benefit from a trend toward passive investing products. In that regard, I think it complements my position in T. Rowe Price Group (TROW). BlackRock is a Dividend Challenger with a 9-year dividend growth streak. I think the stock is attractively valued at recent prices, which is why I started my position in BLK with 5 shares at $468.00 per share. I also started a position in FedEx Corporation (FDX), a transportation company that provides domestic and international shipping services for packages and freight. I think the company’s recent strategic investments in modernizing its operations have made it well-positioned for future growth in volume and will help to preserve its narrow economic moat in a competitive industry. FedEx gives my portfolio some diversity in freight transportation, complementing my positions in the railroads Norfolk Southern (NSC), Union Pacific (UNP), and Canadian National Railway (CNI). FedEx is a Dividend Contender with a 17-year dividend growth streak, highlighted by a 30% dividend increase earlier this year. Some dividend growth investors might avoid the stock because of its low yield, but I view it as a total return investment that addresses both of my long-term investing goals. I started my position in FDX with 5 shares at $242.00 per share and it remains a candidate for new money. In summary, I made two purchases and zero sales during Q3, keeping with my desire to have low portfolio turnover. Transaction fees (year-to-date) have averaged just 0.09% of total costs. It was a particularly quiet quarter for investing activity because of limited new capital until September and a paucity of attractively valued dividend growth stocks. Besides adding or removing parts from my machine, I want to make sure all the parts are running smoothly. I monitor the operating results of my companies and stay on the lookout for dividend increases (or decreases). 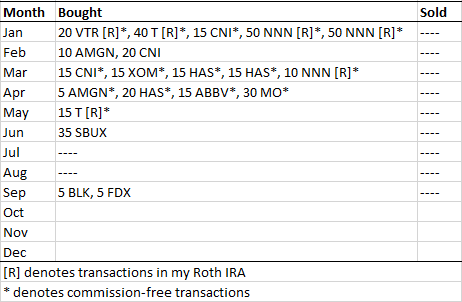 Thus far in 2018, there have been dividend increases for 40 of the 46 stocks in my portfolio. The mean and median increases have been 12.6% and 9.5%, respectively. 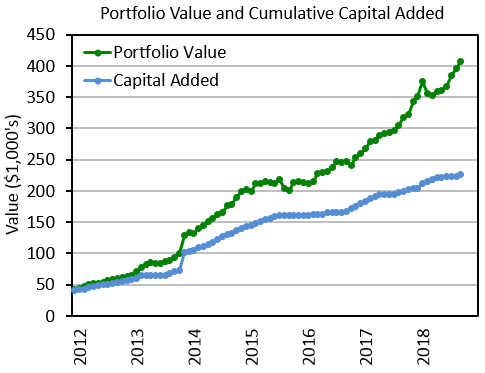 Dividends and capital gains represent the output of my dividend growth machine, all of which is selectively reinvested when sufficient funds are available. As mentioned earlier, my primary long-term goal is to build a sustainable and rising dividend income stream. The figure below shows the dividends I have received. 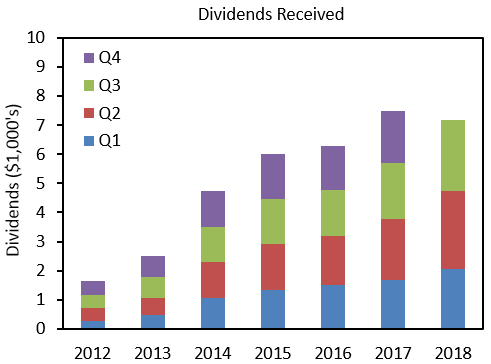 I received $2,447 in dividends in Q3 2018, a 26.6% increase over the $1,932 that I received in Q3 2017. The increase reflects a combination of organic dividend growth, selective dividend reinvestment, and new capital investment. My year-to-date total is $7,165. At the end of Q3 2018, my forward 12-month dividend total was $9,910, bringing me close to the symbolic milestone of $10,000. My secondary long-term goal is to achieve a satisfactory total return on my investments. 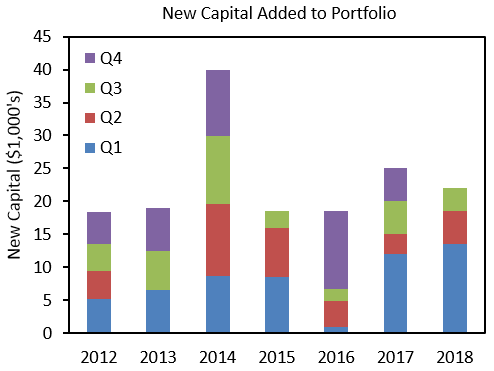 The figure below shows end-of-month portfolio values and the cumulative amount of new capital added since the start of 2012. My portfolio finished Q3 at $406,786. The substantial gain of about $40,000 since Q2 was mostly from organic growth. 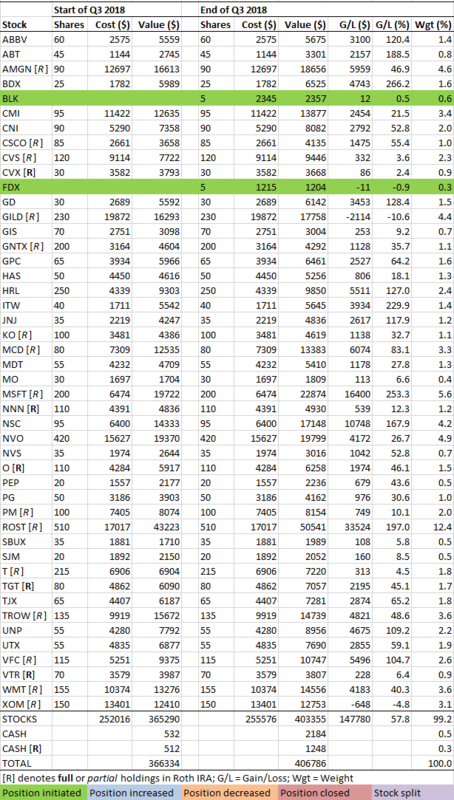 For completeness, I will also summarize the investments outside of my dividend growth machine. I participate in retirement plans with my employer, for which I have allocated 100% of all contributions to the Vanguard Institutional Index Fund (VINIX). The fund tracks the S&P 500 index and has an expense ratio of 0.04%. The combined value of the plans was $90,559 at the end of Q3. I also have a Health Savings Account to which I contribute each year and it ended the quarter with a value of $15,755. Attractively valued dividend growth stocks remain scarce in today’s market, but they are not impossible to find. I anticipate making more purchases in Q4 than I did in Q3, partly because of planned additions of new capital that will enable me to achieve my goal of $25,000 for the year. Most purchases will occur in my taxable account, but I have enough dividends accumulated in my Roth IRA for selective reinvestment. No sales are planned. I am expecting dividend increases to be announced by four of the companies in my portfolio that have not yet had increases effective in 2018. Aside from that, I expect it will be business as usual. Thank you for reading and good luck with your investing! Disclosure: I am/we are long ALL STOCKS IN PORTFOLIO TABLE. I wrote this article myself, and it expresses my own opinions. I am not receiving compensation for it (other than from Seeking Alpha). I have no business relationship with any company whose stock is mentioned in this article.